As part of their excitement for Madonna’s upcoming MDNA Tour, which opens in Tel Aviv, some Israeli fans decided to make this funny tribute video clip and dedicate it to all Madonna’s fans around the world. In his first major print interview in several years, D’Angelo talked to GQ magazine about Madonna. Garbage is currently touring with their latest album “Not Your Kind of People” and pays homage to Madonna. Right before their song “#1 Crush”, Shirley Manson sings a few lines from Madonna’s Erotica. The “Girl Gone Wild” Maxi CD has been released in France & Italy! It’s already available at Amazon France and Amazon Italy, or pre-order at Amazon UK and Amazon USA. Luisa Via Roma is running an exciting new competition. 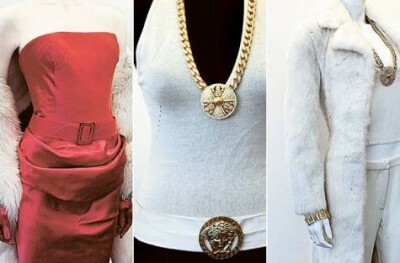 To win, design the FIRENZE4EVER t-shirt for the bloggers to wear to Madonna’s concert in Florence, June 16th 2012! This exciting opportunity will include a round trip travel ticket and accommodation for one night (June 16th, 2012) for one person in Florence, Italy, and a top secret surprise for Saturday night! Tony “The Pastryarch” Albanese has made an original Madonna MDNA Tour chocolate piece. 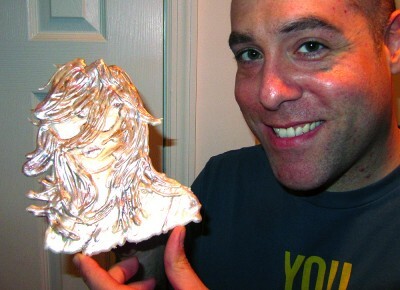 Posing with the edible chocolate piece I made free hand of Madonna’s MDNA Tour promo photo. I had one shot to get it right, there’s no erasing or starting over with chocolate! It is accented with luster dust and pearl dust. More of my cake photos and videos can be seen on www.facebook.com/thepastryarch and twitter.com/#!/thepastryarch. I can also be seen on season 1 of “Cake Boss”. Have a look at some concept & choreography submissions by Michael Schwandt for the MDNA Tour. Note that these are only submissions and don’t represent the final version.